, flooded streets and homes ripped apart by deadly tornadoes. The storm was blamed for at least 20 U.S. deaths, most of them in Florida. By Thursday night, its winds were down to 55 mph, with gusts of 65. "We were prepared for the hurricane, but the tornadoes were bam, bam, bam," said Glenda Nichols, manager of the Microtel Inn in Marianna, Fla. "There was nothing we could do about it. I put all my guests in their rooms and told them to get in the bathtubs." , 1,400 evacuees huddled and commiserated, while outside, Ivan sheared one of the center's air conditioning units and dumped it on top of someone's car, reports CBS News Correspondent Mark Strassmann. Ivan quickly deteriorated to a tropical storm after coming ashore. But forecasters warned it was not done yet: It threatened up to 15 inches of rain and flooding across the South, already soggy after Hurricanes Charley and Frances over the past month. And more danger could be on the horizon: Tropical Storm Jeanne is tearing through the Caribbean on a path that could take it into Florida early next week as a hurricane. More than 2 million residents along a 300-mile stretch of the Gulf Coast cleared out as Ivan, a former 165 mph monster that killed 70 people in the Caribbean, closed in on an unsteady path. Ivan came ashore near Gulf Shores Beach, Ala., around 3 a.m., but it was the Panhandle — squarely in the northeast quadrant of the storm, where the winds are most violent — that took the brunt. Ivan spun off at least a dozen tornadoes in Florida, while creating a storm surge of 10 to 16 feet, topped by large battering waves. A portion of a bridge on Interstate 10, the major east-west highway through the Panhandle, was washed away. Insurance experts put the storm's damage at anywhere from $3 billion to $10 billion. The death toll included 13 in Florida, two in Mississippi, and one in Georgia. In Louisiana, four evacuees died after being taken from their storm-threatened homes to safer parts of the state. Many of the millions of Gulf Coast residents who spent a frightening night in shelters and boarded-up homes emerged to find Ivan was not the catastrophe many feared. New Orleans, especially vulnerable to storms because much of it lies below sea level, got only some blustery winds, a mere two-tenths of an inch of rain and only some downed tree limbs. By Thursday morning, French Quarter tourists came out of their hotels to sip cafe au lait under brilliant sunshine. "Leaves in the pool — that's it," said Shane Eschete, assistant general manager of the Inn on Bourbon Street. "I know I'm going to hear from the Monday morning quarterbacks," said New Orleans Mayor Ray Nagin, who had urged the metropolitan area's 1.2 million residents to flee three days ahead of the storm. But he added: "Look at the scenes from Mobile and Pensacola — that could have been us." Mobile, Ala., a port city of 200,000 that had been in the bull's-eye of the storm, got a break by an 11th-hour shift to the east. Still, its historic oak-tree-lined Government Street was blocked with tree limbs, metal signs, roofing material and other storm debris. The storm turned the night sky an eerie green with popping electrical transformers. Ivan's surf pounded Alabama beachfront resorts for hours, leaving condominium towers standing in a lake of floodwaters, at least one 5-story building crumbling in sand and sending some island homes into the Gulf of Mexico. An initial damage assessment in Gulf Shores found gutted shops, buckled concrete parking lots, and beachfront roads deep in sand. "The rain was going sideways. You could hear metal bending. It was just bad. It was my first one and there won't be a second," said Deb Harwick, who rode out the storm in a motel near Gulf Shores Beach. President Bush plans to visit Alabama and Florida to survey the damage on Sunday, the White House said. Tornado warnings were issued across northeast Florida again Thursday, even as search-and-rescue teams were sent to check the rubble for any victims of the night-before twisters. "It's sad," said a weary Florida Gov. Jeb Bush. "I don't know quite why we've had this run of storms. You just have to accept that." Hundreds of thousands of people were without power, including 90 percent of Gulf Power Co.'s customers in Florida. "It's catastrophic. The electric system it has taken us 80 years to build was basically destroyed in eight hours," spokesman John Hutchinson said, adding that it could take three weeks to restore power. 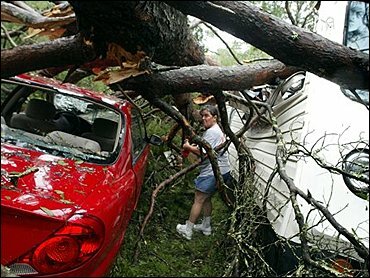 In the Panhandle, destruction was seemingly around every corner. Huge magnolia trees had fallen across the streets, and the trunk of a 25-foot palm had snapped about eight feet off the ground. Bricks from St. Paul's United Methodist Church lay in heaps beside the building. Traffic lights lay shattered in the road. Telephone poles leaned over at precipitous angles, the wires sagging to the ground or just feet above it. Near one intersection, an Oldsmobile sat half-submerged in muddy floodwaters. A block away, two garbage bins and an aluminum rowboat blocked another street. Pleasure boats lay on top of one another in a jumble at a marina. About 1,700 people hunkered down overnight at the Pensacola Civic Center, which was converted into a Red Cross shelter. But evacuees had to be moved from floor to floor as water seeped through the walls, partially flooding the arena and third floor of the five-story building. "It was a force to be reckoned with. This building was rocking and rolling all night long," said Sandie Aaron, manager of the business that operates the building. "We kept thinking, `A couple more hours, a couple more hours.' I was never so glad to see the sun come up today — or at least daylight."